The number and types of food product recalls have increased at an alarming rate over the past few years. 2018 is likely to follow a similar growth trend. Being able to assess and understand the types and causes of food product recalls, we can solve these food safety failures and create solutions to avoid repeating past mistakes. The number one cause of product food recalls in 2017 was undeclared allergens and the mislabeling of products. The most prevalent pathogen, Listeria Monocytogenes, was the underlying cause of many accidental recalls in 2017. Now, the Food and Drug Administration (FDA) and the United States Department of Agriculture (USDA) are under pressure to reduce the amount of time food processors take to initiate a recall once they know a problem exists. 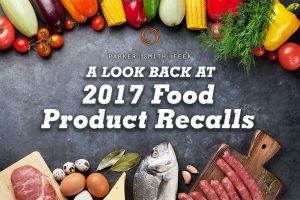 Read the Food Industry Counsel LLC’s latest blog post to better understand the leading causes of recalls in 2017 and how to avoid these same problems in 2018. Parker, Smith & Feek has extensive experience with product recall policies; contact us today to learn more about what you can do to protect your business.